The first version was pan-fried lechon sisig with chopped shiitake mushrooms to lighten the filling and make it less heart attack stuff. I also mixed in onions, garlic, some hoisin sauce and sauteed until done. 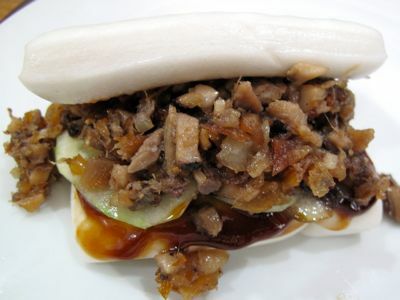 Next I slathered the bun with hoisin on one side, chili sauce on the other, added three slices of cucumber and the sisig and could barely contain myself while snapping a few photos before inhaling the sandwich. YUM in a seriously big way. Cucumbers were slippery and not really needed. The meat was moist, flavorful, delicious. The steamed bread was the perfect foil for the sisig. I am biased, of course, but this was a winner. For a second sandwich, I removed the cucumber, added chopped green chilies in vinegar and some red cabbage pickles I had in the fridge and while this looked good, it was a bit distracting to have the added textures and flavor points from the pickles. It still tasted good, it just wasn’t as pure a sisig hit as one might like. It was, actually, getting a bit over the top. Sometimes you have to stop before it gets ridiculous. It’s like those Momofuku buns, but Filipino-style! What kind of bun is that, MM? Is its texture the same as the siopao bun? It sure looked good and very yuummy! Me, too. Forget the diet. It was super bowl today. Not that I am a football fun. Just love to eat. its good that zubuchon is not near to me, or else it will destroy my diet. Where did you get the buns, MM? I think that looks and sounds phenomenal! hay! feeling ko nagbo-bloat katawan ko habang pinagmamasdan pics sa post na to! yummmy! Umm, looks like a real pre-Carnaval treat. Although lechon called leitÃ£o is a big delicacy in Portugal (traveling towards Coimbra, the university town famous for the song we know as April in Portugal, I came across time and again tiny shacks sheltering ovens that exclusively sold shiny just-roasted piglets), it seems peculiar that this porcine pleasure did not cross the Atlantic in the four centuries of Portugalâ€™s familial relationship with Brazil. Tells you how undisputed and pre-eminent beefâ€™s position is in these parts. Instead, what we have here to celebrate Fat Tuesday with is the prurient sounding leitÃ£o a pururuca which is actually a spatchcocked young pig sandwiched between two heavy wire grids and barbecued until rind turns crisp. It lamentably lacks the lacquered finesse and the unflattened wholeness of our lechon if not the dramatic contrast of textures between the crackling skin and the melting roasted interior but quite tasty in its own right and only more so if one did not know of any better. P.S. The photos are mouthwateringly beautiful !!! MM, I seriously think your Zubuchon buns will give Momofuku’s a run for their money, or at least, be at par. The only advantage Momofuku has is the NYC ambiance! Everything meal just seems so delicious after a long NYC walk. I was just thinking about you MM and how you don’t seem to have as many posts – was thinking it might be because you’re on a diet ;-) Then of course you come up with this whammy of a post! Absolutely shot this one out of the park! 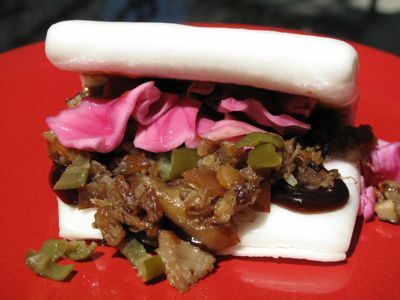 Your momofuku pickles sounded divine, but this post was just … I have no words to describe it! Hmmmm…. now I am craving for pork buns!!! Love your experimenting with your Zubuchons…definitely going to Cebu to try your lechon!!! BTW, MM, for those asking about the buns, I buy at frozen section of Unimart in packs of 8, forgot the brands. They are called Man-tao bread / buns, very similar to siopao buns. In some chinese restos, the man-tao buns are usually in tandem with Hongba/Humba (braised pork belly) to use for dipping in the sauce, and also for Kuapao (mustard leaves with minced pork, in a bun). hope this helps. I agree with the first post. I don’t like you very much right now. :-) Tee hee! You deserve the indulgence, though. For some reason, I am mesmerized by the pristine whiteness of the bun. That’s steamed rather than baked, right? Rasa Malaysia has an excellent recipe for a much healthier Man-tou buns made with whole wheat….you have to try it, MM!…not at all daunting to make…para isa na lang hirap, I make a lot and freeze and then re-steam it with a towel on top of the rim of the steamer so the surface doesn’t get too wet. Note to self: Leave cucumbers on the side. The “teen” must be laughing all the way to the bank for a sure win! 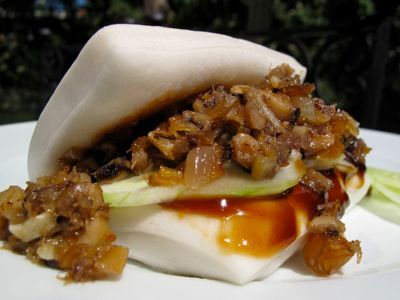 Are those soft buns like the one they use when serving Peking Duck slices w julienned scallions & oyster sauce? The sisig must be really good served like this! Thelma: if you are not into the whole wheat version, the BESTEST and closest to the ones in HK is bellaonline.com. Her recipe is close to the ones my MIL makes. It is time consuming…need to make a starterfirst…but the rest is easy. For pillowy soft ones, the combination of flour is the secet ingredient. Now if you were in HK, the flour that they use there produces the white product. …maybe they are extra bleached! OK…I am just guessing so I don’t want any repercussions from flour companies in HK! Going back to Mantou…cake flour whick doesn’t have much gluten is essential for pillowy soft mantou. But you also need structure so you need to use apf as well in conjunction with the cake flour. What is also vital is the addition of baking powder which takes the place of the acid that reacts with the rest of the ingredients producing the whiteness of the buns. So,on to the kitchen MM and Marisse! …MM…whole wheat version for you and the white ones for the Mrs, the Teen and your entire crew! Wow…I really love those Pao…..gotta get some of those when I am next in the Phils…MM kindly provide Address of Pao outlet from where you bought them. yum. now im super craving for lechon sisig. So the cikes won’t be too slippery, do this, MM…..this is what we usually do with paper thin slices of cukes before wrapping it around a scallop…put the cukes slices on several thicknesses of paper towels and pat them dry before using. It won’t slide off your sandwiches provided you don’t put them on top of mayo or any sandwich spread. I was on the hunt for a sisig recipe and came upon this site. Wow, mouth-watering pics! If you were trying to replicate the Momofuku pork buns, I’m telling you these look so much better! 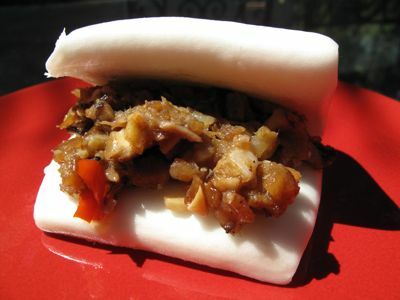 I love the momofuku roast pork buns (but then again, anything siopao and siopao-like, I love! I even like the Red Ribbon siopao — hooray, at last they opened a branch in Queens, NY!). P.S. I have no idea why France is listed as my location… I’m in New York. tiramisugirl, welcom “onboard”… there are over 2,400 posts in the archives so feel free to browse backwards when you have nothing better to do. As for the location, you may be using a corporate access to the internet, and they sometimes use servers based abroad, either for corporate reasons or other considerations. 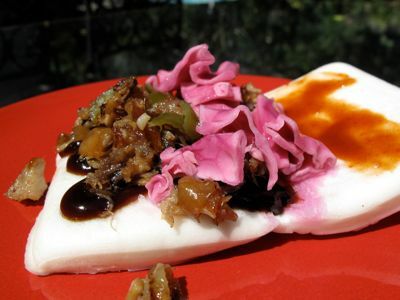 So sometimes, the automatic location indicator is off… bettyq, I thought about that, but the cukes sit on top of hoisin sauce so they still remain slippery… the filling was moist enough anyway, so one can do without the cukes. I got the bread at a chinese rocery in Virra Mall, apparently they are available at several groceries that carry a lot of chinese ingredients. the buns look better than the sisig!!!! hehe!! Ging…you take care of my dog and I’ll take care of your buns!!!! hehehehehe..
For everyone who is thinking green….Ging is the vet of my dogs (a beagle and a labrador)..hahahahaha. Gourdo’s Offers a Discount for MM Eyeball Guests!